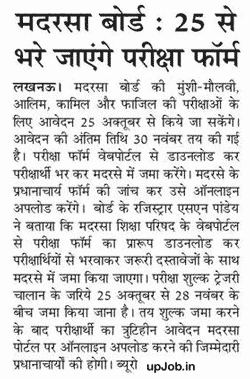 The Madarsa Board has invited applications for various examinations. The applications for the Madarsa Board examinations are starting from October 25, 2018. The last date for filing of application form has been fixed on November 30, 2018. The Madarsa Board conducts examinations for Munshi, Maulvi, Alim, Kamil, Phazil, etc. every year. For this, all the candidates will have to submit their application. The application forms will be filled from October 25 to November 30, 2018 for all these programs. Examination forms are available on the board of the Madarsa Board, from where you can download and after filling this form, you have submitted it to your Madarsa. After examining application form, Principal's of the madrasa are required to upload it online. The Board of registrar said that the format of the examination form is available at web portal of the Madarsa Shiksha Parishad. Candidates are required downloaded it and filled by examiners and submitted along with the necessary documents. The examination fee is proposed to be submitted between October 25 and November 28. After submitting the form, the Principal will be responsible for uploading the candidate's application online on the Madarsa portal. You can download your application from the link given below, after which you have to present the completed form to the Madarsa Board, your school Principal.